Earlier, I wrote all about synthetic microfibre pollution in our oceans. “A Patagonia funded study found that with each wash, one of their polyester jackets sheds as many as 250,000 plastic fibres that are mostly invisible to the naked eye. These synthetic fibres from clothing are smaller than 5mm and make up 70% of the million trillion pieces of plastic in the ocean because they’re so small, 40% make it through council water treatment plants.” I’d recommend reading that post first, then coming back to this one. Today, I’m talking about the steps I’ve taken to reduce my own contribution to the problem. As I see it, we have two ways to help. Using microfibre filters when we wash the polyester we already own. Thanks to my friends at Biome, I’ve been experimenting with a White Magic Microfibre Laundry Bag as well as wearing more natural fibre clothing such as the 100% linen Seaside Tones shirt. To do their part for this issue, Biome has now added an entire Slow Fashion section to their website! They have always vet their beauty products so well to only the most ethical of businesses and no animal products except bee by-products, so I was really thrilled at this expansion because you know you can shop stress-free without having to do a background check on their brands. These products were gifted to me and I have an affiliate relationship with the store but I requested these products because I believe in them, this article is not sponsored and all opinions are entirely my own. Starting with the linen shirt. Linen is one of the most sustainably produced fabrics on Earth, made from flaxseed. Yep, the stuff I put in my oatmeal every morning. Recently when I polled my followers on their favourite material there was no surprise that linen was the winner for its comfort, aesthetic, durability and sustainability during production. Linen is a low impact crop that is completely safe for the skin and can be composted at the end of its life. It’s moisture wicking, quick drying, cooling, very strong and durable, plus it maintains its shape. If we all made a switch towards slow fashion made from fabrics like linen we wouldn’t just stop our contribution to microfibre pollution and help preserve the oceans for future generations, we’d also be living our best lives! The Green Hub recently posted this article discussing how microfibre filters are being proven to work. It’s still unclear precisely how effective microfibre filter bags are, but the estimates are they are similar to the Cora Ball results in the linked article. I have had my White Magic Microfibre Laundry Bag for four months and I definitely like it and recommend it. With every load I just add my synthetic items inside the bag, leaving out sheets or towels that are too bulky. Fortunately, I don’t buy a lot of synthetics so it’s mostly Tim’s cycling gear, our Boody products and the microfibre towels we use around the house. What goes inside the bag? Anything containing polyester, nylon, acrylic or other similar plastic fabrics including cotton blends. How much can you fit inside the bag? It’s 50x74 cm, so quite a lot! I don’t know the volume in Litres, but it’s plenty big enough for two adults washing once a week or so. If you are washing lots of fast fashion made with synthetics or have a large family, you may want to start with one bag and then see if you need a second. Like a sieve! This technology has developed out of the cooking industry. They use the same method for nut milks, cheese, soups and water filtration in professional kitchens. It looks and feels like my nut milk bag but is essentially just a delicate garments bag that can catch pieces of plastic and trap them inside for you to collect after the wash. I can see the fibres, it’s pretty clearcut. Independent studies seem to all be supporting the product so far and after taking my time to really try it out and form my own opinion, I think the evidence is quite... evident. Does the bag itself shed plastic? The bag itself is quite a sturdy, rough plastic made of 100% polyamide, a hard nylon. It’s quite scratchy and feels closer to a dry-cleaners bag or a fishing net than it does an item of clothing. The company states that it doesn’t shed and while I don’t have my hands on any evidence to validate the claim, I know that there are no fibres of the bag inside of it after a wash and I’m confident that it could not be shedding more than its catching. How do you dispose of the fibres? I scrape them out with my finger and put them in my landfill bin. No idea! This technology is very new. I’m not sure it’s been around long enough for someone to have worn theirs out yet. If this bag really does reduce 25% of two people’s microplastic pollution, then $25 AUD is absolutely worth it. No question. 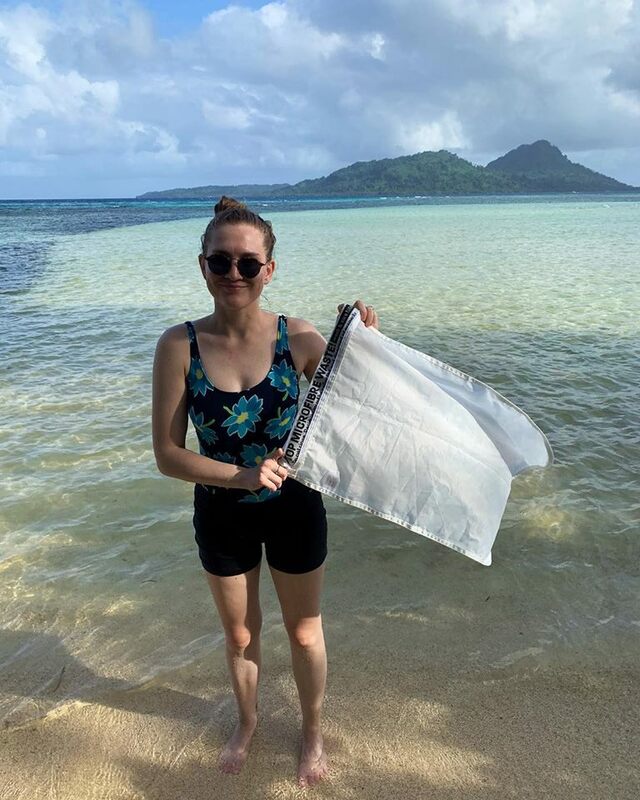 Microplastic pollution can be a terrifying concept to wrap our minds around when we look at the scale of the problem, but instead of burying our heads in the sand (because ew, sand is full of plastic), there are simple and affordable lifestyle swaps we can make to be part of a radical plastic revolution. Buying a microfibre filter might itself feel like sticking a bandaid over a bullet hole but if we pair that small action with consumer behaviour trends and collaborative civic action (lobbying corporations and legislators to demand better manufacturing systems), what you end up with is real social change. Whether microfibres were something that were previously on your radar or not, I’d still recommend clicking through to the microfibre filter bag and considering whether that $25 investment could be right for you. If it’s not you can still like, comment and share this article to help spread the word about a breaking environmental issue that has yet to have its time in the limelight. A note on affiliate links.